Lucasfilm’s “Solo: A Star Wars Story,” directed by Academy Award®–winning filmmaker Ron Howard—the creator of unforgettable films, such as “A Beautiful Mind,” “Apollo 13,” “Parenthood” and “Splash”—is an action-packed journey that explores Han’s first encounters with future friend and copilot Chewbacca (Joonas Suotamo) and notorious gambler Lando Calrissian (Donald Glover). The film takes viewers on a ride showing Han’s adventure-filled past alongside fellow street thief Qi’ra (Emilia Clarke) and career criminal Beckett (Woody Harrelson). 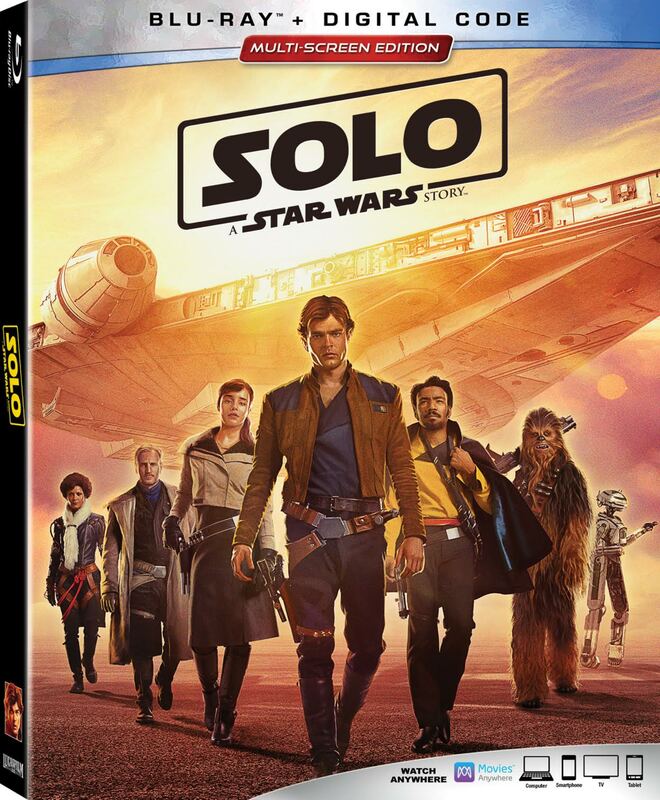 “Solo: A Star Wars Story” bonus material takes fans behind the scenes with the star-studded cast and screenwriters Jonathan Kasdan & Lawrence Kasdan (writer of Star Wars: The Empire Strikes Back and Star Wars: Return of the Jedi). Special features include a revealing feature on Chewie and his enduring friendship with Han; a close-up look at the original version of the Millennium Falcon and Han’s first time piloting the infamous ship; the creation of the film’s otherworldly settings and pulse-pounding action sequences; and eight never-before-seen deleted and extended scenes. “Solo: A Star Wars Story” bonus content takes fans behind the scenes to experience compelling discussions with the star-studded cast and screenwriters Jonathan Kasdan & Lawrence Kasdan (writer of Star Wars: The Empire Strikes Back andStar Wars: Return of the Jedi); a revealing feature on Chewie and his enduring friendship with Han; a close-up look at the original version of the Millennium Falcon and Han’s first time piloting the infamous ship; the creation of the film’s otherworldly settings and pulse-pounding action sequences; and eight never-before-seen deleted and extended scenes. · Kasdan on KasdanIconic Star Wars screenwriter Lawrence Kasdan and son Jonathan share what it was like to write the movie’s script together. Lucasfilm Ltd., a wholly-owned subsidiary of The Walt Disney Company, is a global leader in film, television and digital entertainment production. In addition to its motion-picture and television production, the company's activities include visual effects and audio post-production, cutting-edge digital animation, interactive entertainment software, and the management of the global merchandising activities for its entertainment properties including the legendary STAR WARS and INDIANA JONESfranchises. Lucasfilm Ltd. is headquartered in northern California.